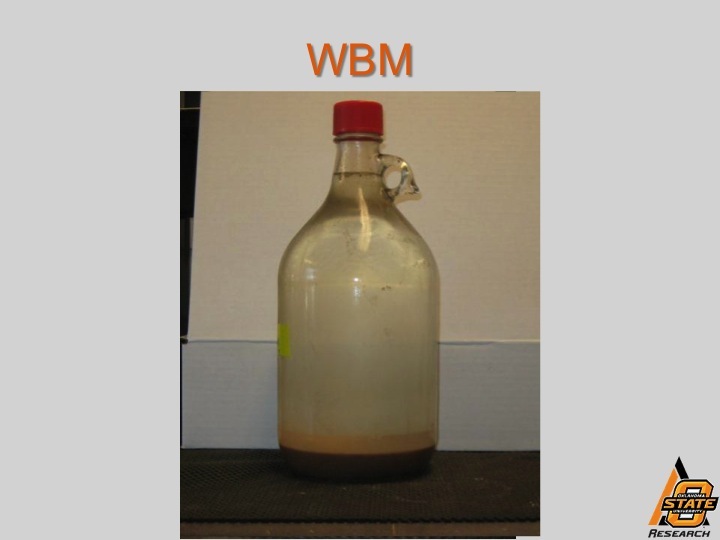 The recent increase in oil and gas exploration has resulted in the production of more water-base mud, (WBM), a by-product from the drilling process. The most common method of disposal for this material is land application to agricultural and grazing lands. As the name implies, water is the most common component of water base mud, but water-base mud also contains dissolved solids and sodium and a small amount on non-dissolved solids. 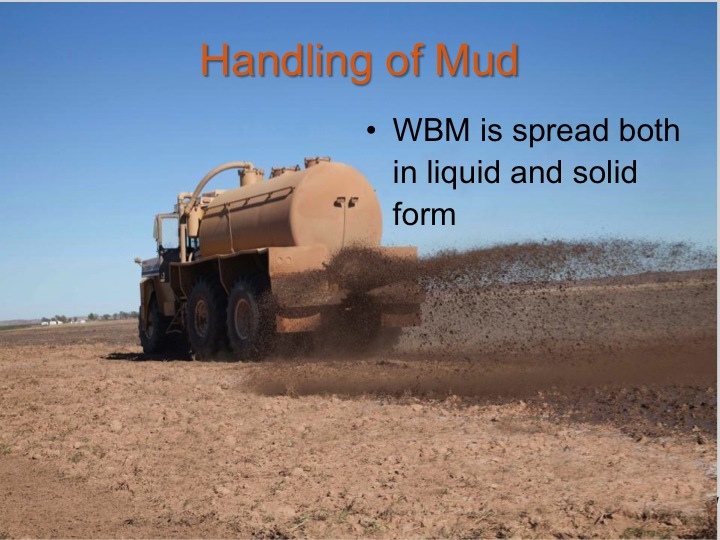 Therefore the primary risk associated with over application of water-base mud is the soil becoming saline or sodic. Water-base mud is mostly water, but also contains dissolved solids that, without agitation, will settle out of solution over time. Soil salinity can be a problem for plants. Excessive salinity (approx. > 7,800 ppm for wheat) can decrease the ability of the plant to extract water from soil, even when water is plentiful. Salts can also interfere with germination. Germination reduction due to starter fertilizers with excess nitrogen or potassium, for example, are an example of how salts can inhibit germination. The solution for excess salt is typically water in the form of rainfall, as the water will move the salts deeper into the soil and out of the rooting zone. Unfortunately, rainfall in western Oklahoma is not always plentiful enough to achieve this downward movement and salts can accumulate. OSU researchers Dr. Chad Penn and Dr. Jason Warren initiated a study at Lahoma, Oklahoma in 2012 to determine how in-season application of water-base drilling mud affected soil salinity and wheat yield. They evaluated 4,000 and 6,000 lbs/ac of total dissolved solids (6,000 lb/ac is the maximum allowed by the Oklahoma Corporation Commission) and five different timings from 16 October to 20 March. A detailed description of their findings is available in Current Report CR2272 at www.wheat.okstate.edu. Drs. Penn and Warren found that the salts from the water-base mud accumulated in the top three inches of soil initially. Rainfall for the next 90 days was scarce (0.5 inches total) and the salt remained largely in the top three inches of soil. Once rainfall picked up, however, the salts started moving downward through the soil profile. As expected the 6,000 lb/ac total dissolved solids rate resulted in greater soil salinity than the 4,000 lbs/ac rate, so the less you apply per acre, the lower the chances of increasing soil salinity to toxic levels. 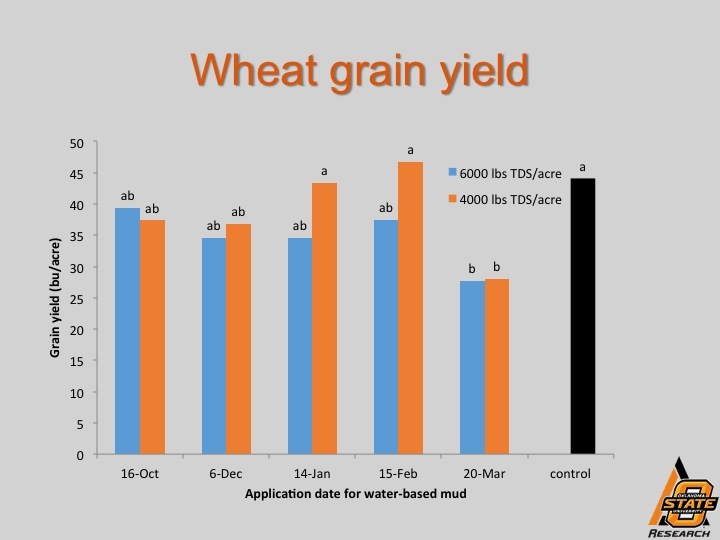 In this study water-base mud applied to wheat prior to approximately first hollow stem did not significantly affect wheat grain yield; however, water-base mud applied March 20 (approximately jointing) reduced wheat grain yield. Their recommendation resulting from this study was not to apply water-base mud after February 15. It is also important to consider the effects of wheel traffic and associated soil compaction from applications of water-base mud. This blog entry is a summarization of OSU Current Report 2272 Application of water-base drilling mud to winter wheat: impact of application timing on yield and soil properties. You can view the entire document at http://www.wheat.okstate.edu under Wheat Management then Fertility. Dr. Chad Penn (chad.penn@okstate.edu) and Dr. Jason Warren (jason.warren@okstate.edu) are authors of the publication.